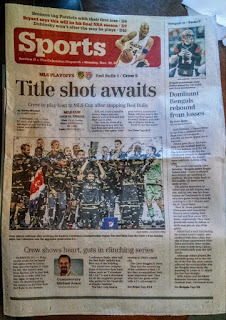 I figure that since the team here that I've been writing about for the last five years has made the MLS Cup Final I'll get a little loose and journal-like leading up to this Sunday's game. First up is a little housekeeping note; The site podcast "Red Cards in Helltown" will be recorded later this week. The plan is to have it ready for everyone Friday. We sort of expected Columbus to advance (and likely host) so we felt like a preview show might be neat instead of covering the result. We've been all over that the last few weeks, though. If you want to check those shows out head over to iTunes or Soundcloud. 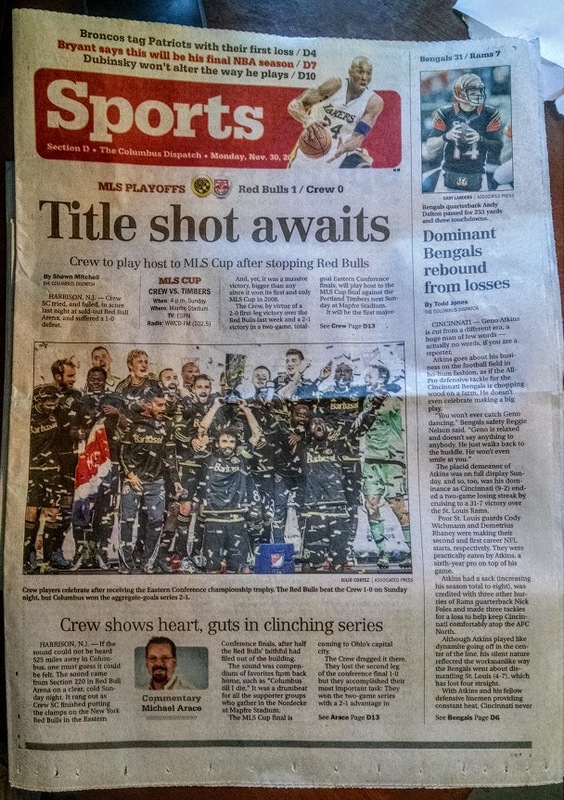 Next up is the sports page of today's Columbus Dispatch. The paper does a nice job of providing team coverage despite some comments otherwise. Adam Jardy recently got moved over to Buckeye Basketball shortly after the paper was sold so it looks like Shawn Mitchell will have the job until this season is over. My understanding is that no one has been assigned the beat on a permanent basis. Nice photo on the cover by AP's Julio Cortez. Speaking of... there were a lot of pretty pastel colors last night after the game ended. I took a quick snapshot of head coach Gregg Berhalter getting interviewed after the game because I thought it was so neat looking. Games at Red Bull Arena in Harrison, NJ generally have a soothing blue hue to them because of the seats. The smoke muted that a bit and brought out some greens and reds, like what you get on a cloudy day. The muted background also makes it look three dimensional in a video game-y kind of way. Doubt it will look like that post game in Columbus after the final on Sunday. Mapfre Stadium is filled with yellow and gray bleachers and seats. It creates its own brand of neat though. During winter games the stands are filled with people wearing black or dark colors. When the stadium is full you get this sort of wildly intimate atmosphere. It's a cross between being in a gym watching a basketball game and a spaceship with nothing around the stadium but the vastness of space. I got my tickets for it early this morning at the stadium box office. There was a decent sized line when I got there a little after 9 am. I'm hearing now it is sold out, but I have a feeling they will figure out a way to sell more. The folks standing around me seemed to be in it more for the event save for the group towards the front who seemed to be supporters. A group behind me talked about the 2001 final that was held at Crew Stadium. 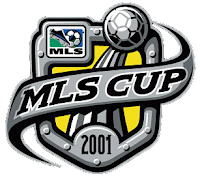 It was used as a neutral site then and featured the LA Galaxy and the San Jose Earthquakes. Lots of memorable players on both those teams. At least as far as MLS goes. Landon Donovan and Dwayne De Rosario scored that day to give the 'Quakes the win. Speaking of that game - I hadn't looked up the logo until just now. It featured elements of the original Crew logo, including rivets and the color gray (which is the forgotten Crew color). The whole thing is gloriously ugly, haha. What a damn mess. 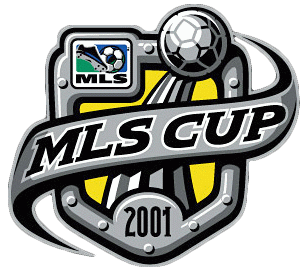 I do like the practical nature of the rivets and how the old MLS logo fits in. It's like a physical thing. To the designers credit, it does have weight to it. You sort of have to strain to see it because of the rollercoaster ride your eyes go on because of the sash-type thing and the railroad-ish tracks the ball is on. Within the world of soccer logos, that design could be seen as ahead of her time when you consider the eyesore that is the new Bethlehem Steel badge. 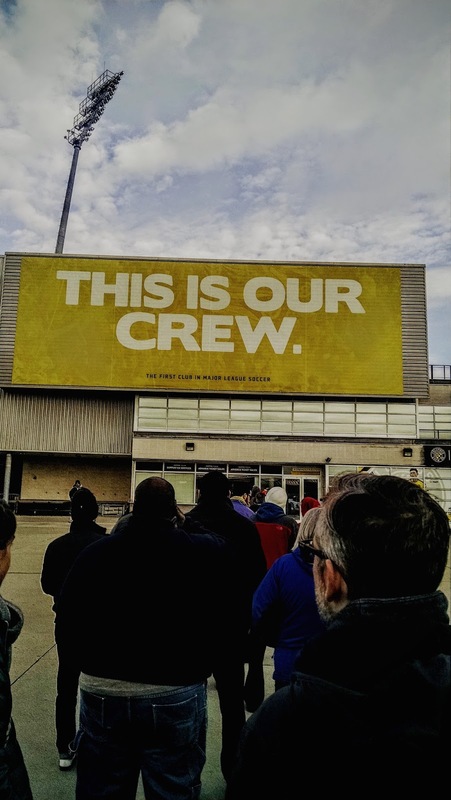 That said, there are folks that have done a great job here in Columbus and the Crew SC aesthetic. I'll post more this week but here is an example of what they are doing well. Could be I like it because it reminds me of a header image I did for Massive Report a bit back. Sort of makes me what to set up a FIFA or FM simulation and pit these two rosters against one another. 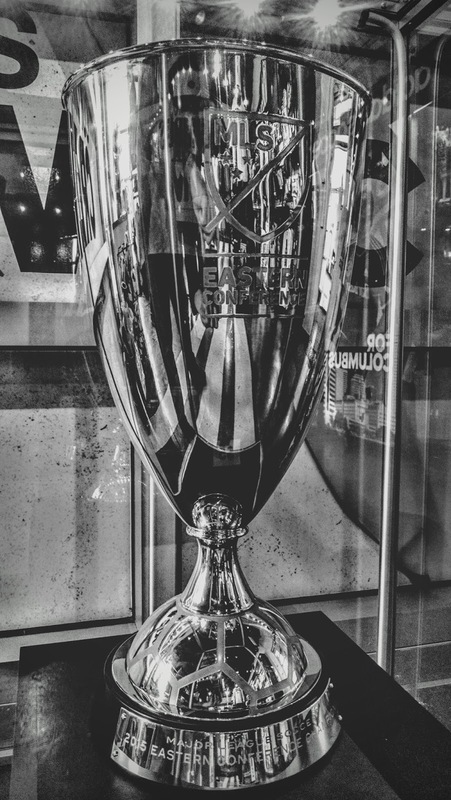 Running out of time so last up here is a Google photo-edited shot of the Eastern Conference Champs Trophy. They had it on display in the team shop this morning when I was getting tickets. One thing this hardware had me wondering today was whether or not there was a separate trophy for the regular season conference winner AND the Finals winner. Looks to be only one trophy. I hope it is anyway. Let's make it nice and big.